By his count, middle school teacher Brian Van Dyck has taught 5,000 students about computer science over the past 20 years. He’s currently doing so at La Entrada Middle School in Menlo Park where he offers Innovative Computing Experience as an after school academic credited course. This summer he’ll be offering classes through Embark Labs where he serves as Director of Curriculum and Instruction. Brewing beer in college was coincidental to his first career, as a beer salesman, working for baseball Hall of Famer Joe Morgan’s distributorship. “Joe is a great guy and influential boss,” Brian said. This will be the first full summer of programs offered by Embark Labs. 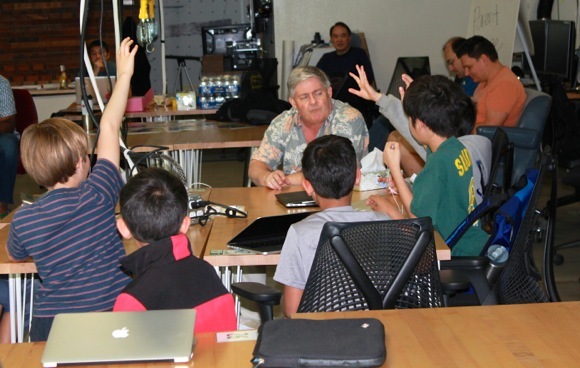 Classes, aimed at 7-17 year olds, will be held at UMe in Menlo Park. “Our mission is to help develop the innovators and creators of the next generations using computer science and coding,” explained Brian. “Most of our camps are one-week offerings, but students can sign up for more than one week. A full schedule of classes is available online. Next post: View from the Bike Lane: Stop signs are not suggestions!